My nephew, Fabian, has asked that I write another creative little story. I may have come across as a writer with some of my blogging. In all honesty, I am just creative! LOL! If it can be crafted, I'm gonna do it! I do write on occassion, because, well, I often have lots to say! 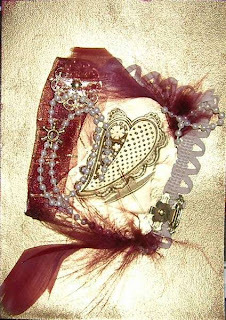 :) But my first love, is paper crafting. Maybe I should have told Fabian I'm being heavily medicated these days and the can opener blog was inspired one day when I took some serious medication for pain AND was trying to open a can. LOL! But have faith, Fabian! I'm working on my 'Twas the Night Before Christmas' parody I send out every Christmas. And now and then, as I've written before, I do have things to say! But for now, I'm writing about my first creative outlet. The only reason I started blogging . . . really. Today, I'm coming on here to share something with you. It started as an experiement. I was learning a new technique. I like new techniques. Reminds me that I am not all that I think I am at times! :) Anyway, I goofed the image and so I started layering things around it to maybe downplay the goof and no one would notice it. Of course, I point it out! :) I got kind of carried away with the layering and by the time I stopped, well . . . let's just say, I forced myself to stop! LOL! And this is what I ended up with. I still have it. I've never given it to anyone. I guess cause everytime I look at it, I see my goof. :) Oh, I'm not unhappy with all my creations! Here's one that I absolutely love! I made it for a contest and can you believe that it did not win?! Cause I still can't believe it did not win! 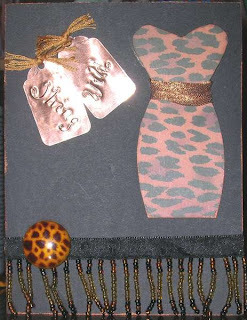 Cardstock, EK PP/metal, Wal-Mart ribbons, vintage button, DSX floss, StampCraft bronze ink. Oh, I got off the subject there for a bit. Sorry, What made me start thinking about my cards is that there's a stamping company looking for a new design team. I immediately thought of my friend, Heidi and suggested to her that she should apply for it. I then remembered that when I grow up, I want to do something in the scrapping field. So, I'm contemplating applying myself. It's not whether I win or lose, but how I play the game, right? Yeah, right, whatever! Before I leave, here's another experiment. 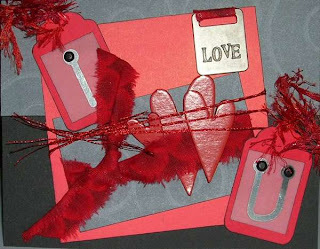 I was learning to make tag books. All I will say is that this almost made me cry! Long story short, the paper is NOT supposed to be cut but folded into an accordion and I got the bright idea that I wanted each panel to be a different color and type of paper and so really, I brought the water works on myself without any help! :) My kids are in these tags and I just like to show them off. It's their graduation pics.